Lytle Street: Rethinking the right-of-way. NOTE: FINAL APPROVAL BY CITY IS PENDING. When Hazelwood Green is fully built out, approximately 4.5 miles of new rights-of-way will be built and dedicated to the City as public streets. This time last year, Scott Bricker (BikePGH’s Executive Director) pointed out that this is a rarity, an opportunity to design new urban rights-of-way from scratch. A challenge was presented, can Hazelwood Green flip the script, prioritizing active transportation before private vehicles? With Blair Street and Hazelwood Avenue nearly completed, the in-design Lytle Street project provided the perfect opportunity to rethink how space in the public right-of-way is allocated to modes of transit. After a year of design and coordination with the City, the resulting design will be a first for Pittsburgh – a truly people-first street – in several ways. CHICANES & ALTERNATING PARKING. A chicane is a curb extension that creates a lane shift intended to slow vehicular traffic. In the case of Lytle Street, chicanes are also used as a tool to alternate street parking from either side of the street every block. RAISED CYCLE LANES. Frequently seen in Europe, with only a handful of examples in North America, Lytle Street incorporates cycle lanes that are protected through grade separation. 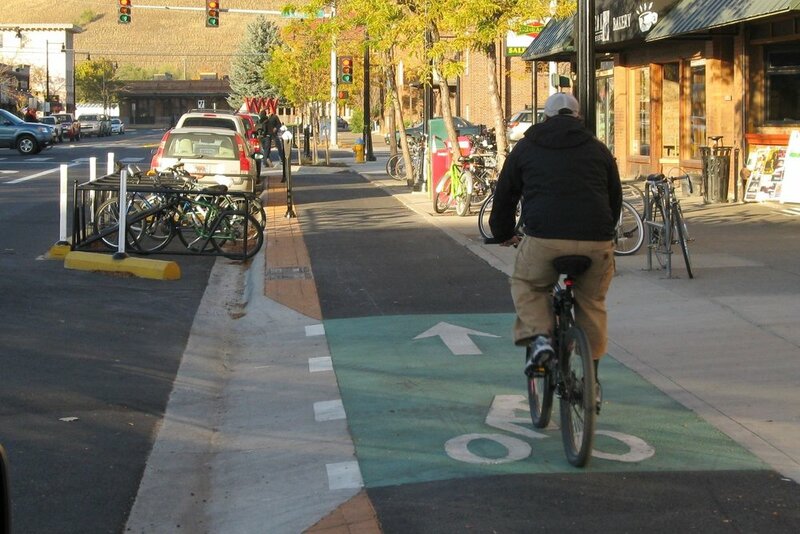 With a 3-foot buffer from the curb and a 5-foot planting and furnishing area that serves as a transition zone for pedestrians, the 5’ cycle lanes provide a comfortable and safe space for cyclists of all abilities. 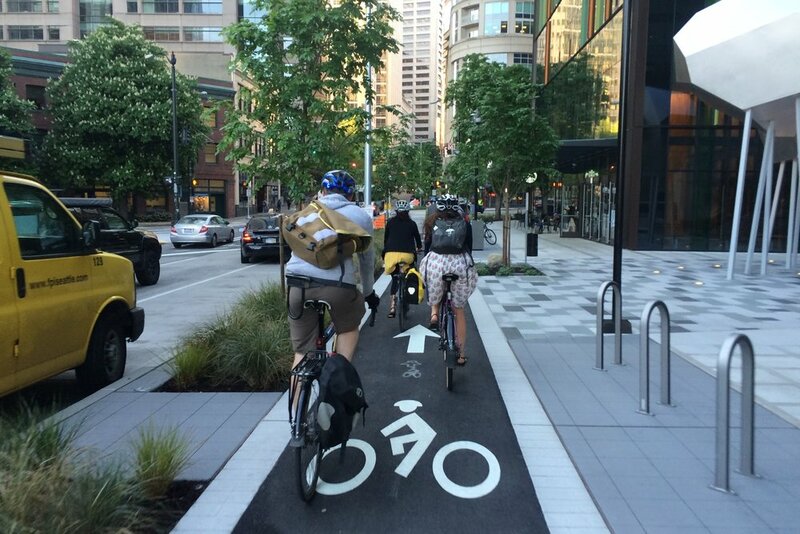 As of this Fall (2018), the draft edition of American Association of State Highway and Transportation Officials’ Bike Guide includes (for the first time) protected bicycle lanes (including sidewalk level lanes) and protected intersections. RAISED INTERSECTIONS. Most pedestrian and cyclist collisions occur at intersections, where conflicts between all modes are most frequent. 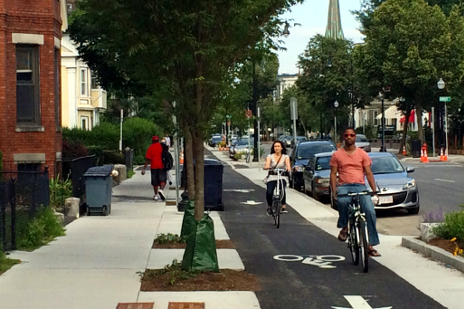 To address this challenge, Lytle Street employs raised intersections (aka a table-top intersection) that serves to (1) reduce vehicular speed through establishing an extended speed hump and (2) enable an uninterrupted pedestrian and cyclist travel path. GREEN INFRASTRUCTURE. Street trees on Lytle Street are on average every 30 feet to ensure a good canopy, which in turn will create a more comfortable streetscape, slow traffic, filter air and rainwater, and provide shade for pedestrians. In addition to providing ample space for the street trees to grow and absorb rainwater, three blocks of Lytle Street are also acting as a pilot to test and demonstrate the effectiveness of green infrastructure in managing and filtering rainwater. The three blocks of Lytle Street along the front of the Mill 19 building employ 100% green infrastructure (i.e. swales and planting instead of pipes) to manage and convey rainwater to the retention area north of the street (on Block 15). The terms “pedestrians” and “cyclists” are not intended to be exclusive of other modes, but rather to easily define two different speeds of travel in each lane; the sidewalk and cycle lane, respectively. One should consider that sidewalks, while designed to pedestrians should accommodate modes that travel at speeds between 0 and 4 miles per hour. Similarly, the cycle lane - primarily designed for cyclists - is suitable for other modes (i.e. rollerbladers, skateboarders, scooters, joggers, etc.) that travel 5 and 15 miles per hour. Finally, there are those whether on a bicycle, electric-assist bicycle, and/or scooter that are comfortable and able to travel at similar speeds to vehicles (15mph+), this group may choose to mix with vehicular traffic in the travel lanes on-street. Lytle Street is Hazelwood Green’s only north-south Secondary Street and serves as the site’s main pedestrian-oriented street, where active ground floor uses and pedestrian activity shall be focused and concentrated. The street will be monitored for performance to advance future duplication. It is anticipated that Lytle Street will incorporate public amenities, public art installations and interventions, and facilities to accommodate festivals, block parties, and other special events in coordination with activity on the Plaza. The Lytle Street project also includes Street “C” (street name to be determined), which is designed in the same vein as Lytle with the main exception of 11-foot travel lanes (instead of 10-foot) to better accommodate larger vehicles, i.e. trucks and buses. Both of these streets, along with a temporary parking lot and the completion of Blair Street (and the CSX canopy) are underway this fall. It is expected that Lytle Street and Street “C” will be completed and opened in Summer 2019. The streets are well underway and taking shape. With the majority of utilities, curbs, and concrete base in place, crews are moving onto intersections, sidewalk and bicycle lane construction. The Lytle Street Infrastructure Project and CSX Canopy Project was awarded to Mele & Mele & Sons, Inc. (Mele) as the lead contractor. Mele has a strong working knowledge of the site both through current and past projects at Hazelwood Green. Check back for updates as construction on-site continues. Anthony Mele, Mele & Mele & Sons, volunteering time and equipment to set the flower sculpture at the Gladstone Middle School in Hazelwood on Saturday, September, 22, 2018.